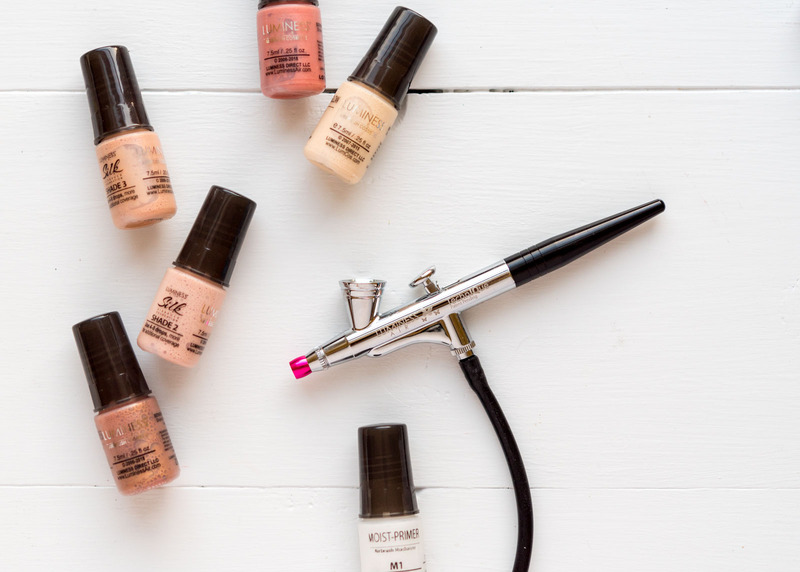 When it comes to creating a flawless makeup look on a time crunch, air brush makeup is by far one of the quickest and easiest methods. In fact, it’s widely used by professional makeup artists on busy sets where super speedy, flawless, and hygienic makeup application is a must. How Does the Luminess Air System Work? 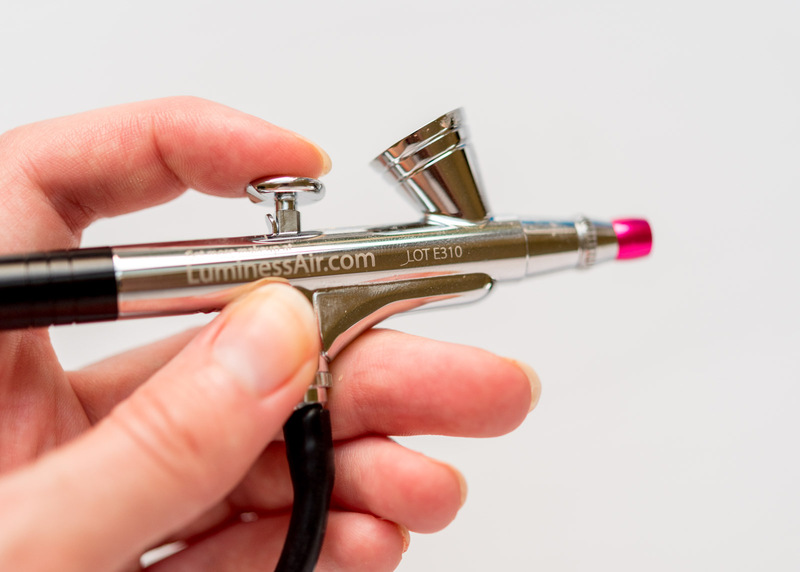 The Luminess Air Airbrush System uses a very gentle airflow through a pen-sized spray nozzle. When held at the proper distance (about 6-8 inches), it creates a diffused, delicate, your-skin-only-better look, with a weightless finish. The air flow targets a small area of your face at a time, making this mess-free (it doesn’t get all over your clothes/hair like you might expect). This also helps in the application process (especially for highlighting, contouring, and blush) as the air flow allows you to ‘feel’ for where the products are hitting your skin, even while keeping your eyes closed. 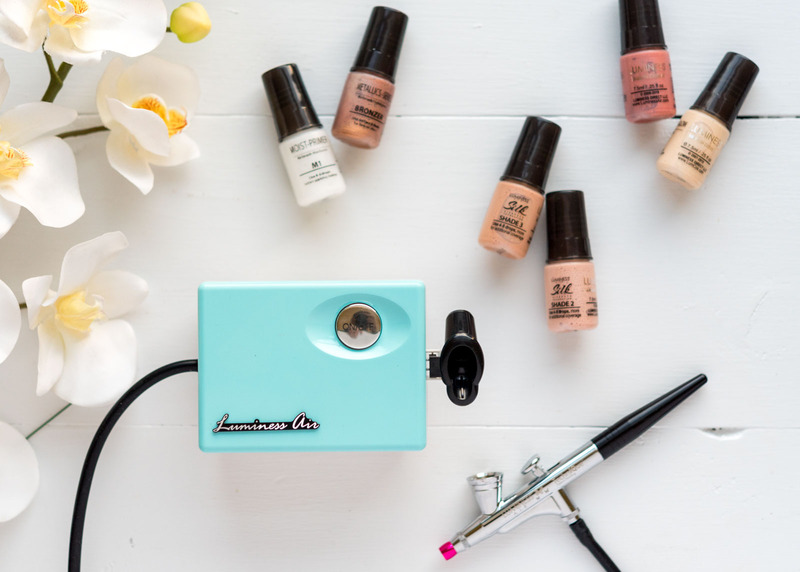 Lastly, the Luminess Air Airbrush System makes for an extremely hygienic way to apply makeup. Forget the dirty hands, sponges, and brushes – they never touch the face (unless you’re doing touch-ups, but I find those are rarely needed). Plus the foundations come in little dropper bottles that dispense the foundation right into the stylus to further prevent contamination. Satin – For dry skin types; hydrates skin for a dewy and supple look. Matte – For oily or combination skin. Evens and enhances, and eliminates shine. Ultra – In between Satin and Matte – great for combination skin. Hydrates dry areas while adding a radiant-yet-matte finish to oilier areas. Mystic – Mystic is a premium, all-in-one foundation, concealer, corrector and primer that gives you radiant coverage and a naturally flawless finish. (All foundation formulas are fragrance-free, so they work for even sensitive skintypes). My excitement for this nifty little system led me to create this quick 5 to 10-minute everyday makeup look that lasts all day. I’ll be walking you through how I use the Luminess Air Airbrush System, as well as the products I use from Luminess to create an airbrushed makeup look. Let’s get started! 1. To start, I’ll get the Luminess Air Airbrush System setup up (i.e. 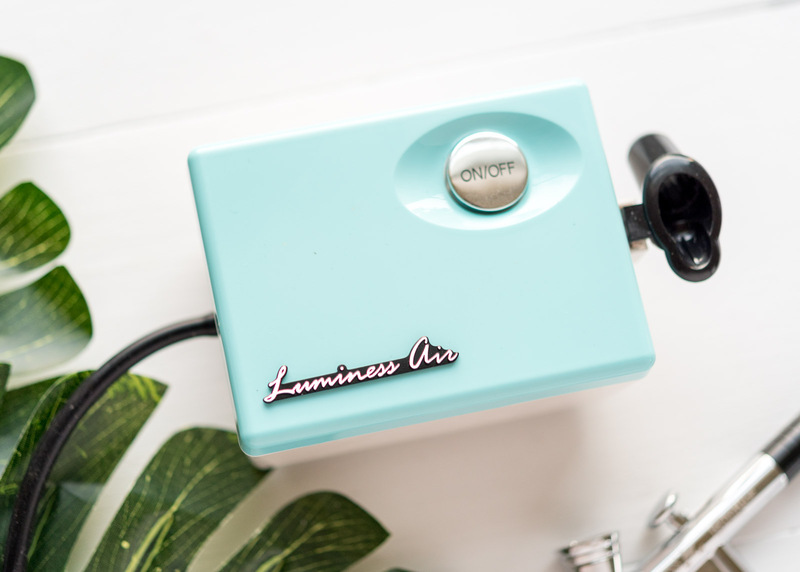 plugged in and turned on) then I’ll add in 4-6 drops of the Luminess Air Oil-Free Moisturizer and apply this all over clean skin. This gets the skin primed, and all smoothed and evened out. 2. Next, for the foundation, I’ll apply 3 drops of the Luminess Air Silk foundation in a shade lighter than my skin (shade 2). I’ll make sure to hit under the eyes, tops of the cheeks, forehead and nose. 3. For the rest of the face, I’ll use another 2-3 drops of a shade that matches my skintone best (for me, that’s shade 3), and apply it in small circles over all areas. What’s great is that this foundation is buildable without sacrificing the flawless and weightless look and feel. If you want more coverage, you can simply add another 2-3 drops and layer over the first application. Fortunately, my skin has been in pretty good shape recently, so I haven’t had the need for too much coverage. 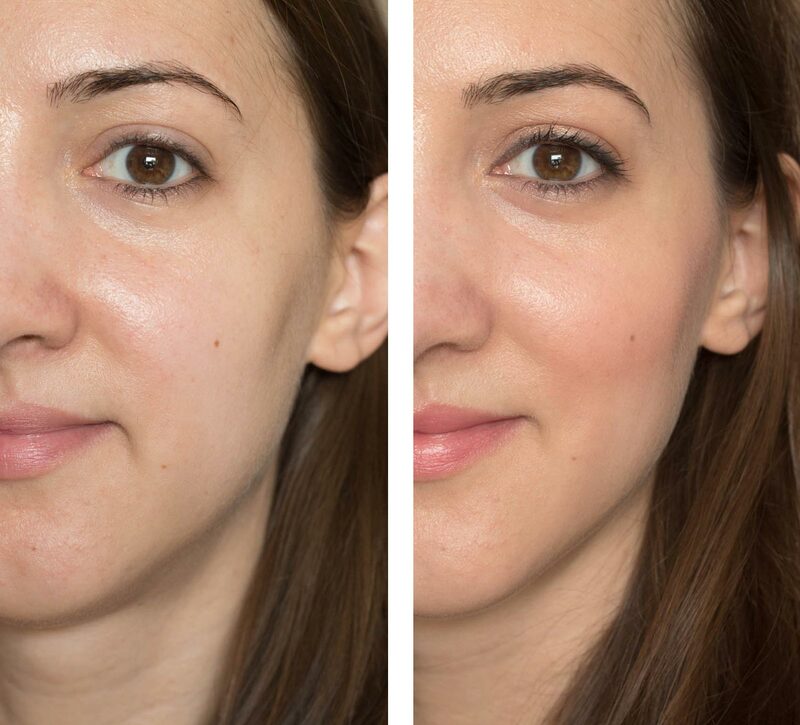 Between my first (shade 2) application, and my second (shade 3) all-over application, the result I get after using the Silk foundation is even, sheer-to-light coverage that hides the redness on my cheeks and blurs imperfections while still looking very natural. 4. Moving on, my next step is to add 1 drop of blush into the airbrush pen, and then apply it in an oval shape over the cheeks. The shade I’m using for this look is called Soft Rose – it’s a gorgeous warm rosy shade that mimics a natural-looking flush on the cheeks. 5. I’ll finish the face by adding 2 drops of the Skin Brightening Glow and applying on the tops of the cheeks. This adds a subtle, natural sheen to the skin (no heavy glitter or shimmer here). 6. To complete the entire look, I’ll lightly fill in the brows, apply some eyeshadow, eyeliner, and mascara, and then some lip tint. 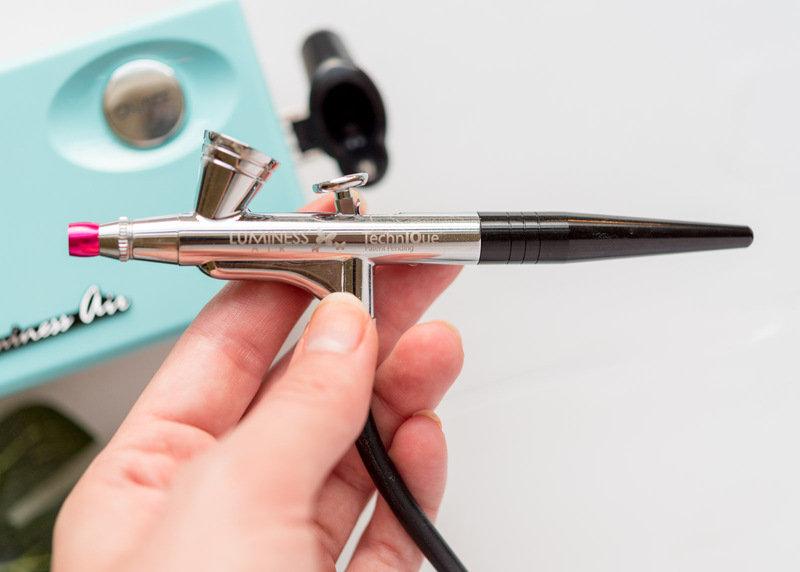 Cleaning the airbrush stylus takes about 60 seconds (no more than cleaning your makeup brushes). You simply add water and cycle it through the stylus a few times, then use a Q-tip to remove any extra residue from the top cup/funnel. Then you’re done! Make sure to follow the 6-8 in rule – this is so important if you want that natural, airbrushed, diffused look. Go light on the blush, glow, and bronzer (1-2 drops) to start. You can always build it up if you want more intense color. Try not to exceed 2 coats to get the most natural, barely-there look. Play with the different shades and textures! Add a few drops of the Luminess Skin Brightening Glow in with your foundation for an all-over subtle glow. 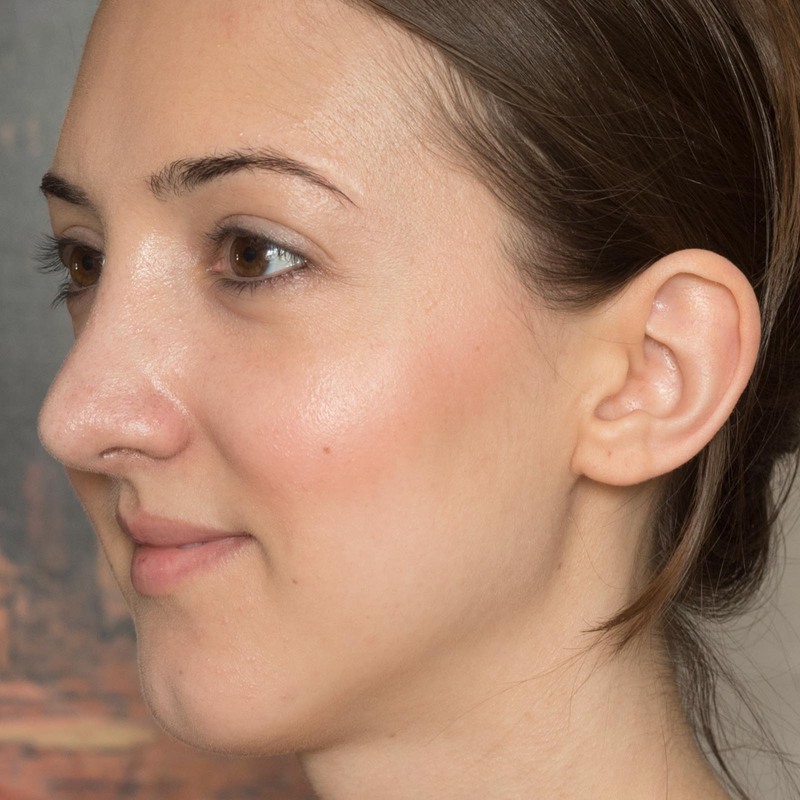 Use different shades to contour (for example, use 1 shade lighter around eyes, forehead, and nose, your matched shade all-over, and 1 shade darker under the cheekbones and around jawline and temples). Wipe off brows with a damp Q-tip afterwards to remove any foundation. Always clean the stylus after each use – this will prevent clogging and keep your system in tip-top shape! Overall, when it comes to quick, natural, flawless coverage, and a mess-free, clean makeup application, air brushing easily beats out all other methods. If you’re on the market for an airbrush system, I absolutely recommend checking out Luminess Air Airbrush System. 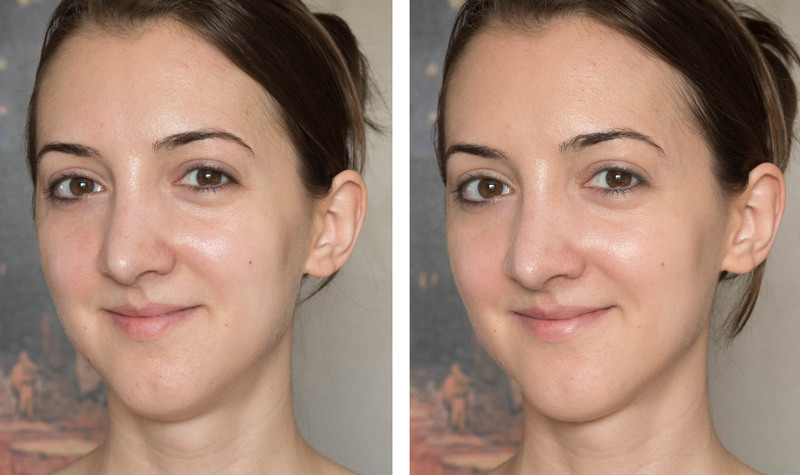 If you’d like to see more airbrush makeup looks, check out a minimal makeup look using Luminess Air’s Mystic Foundation, or an airbrush pre-foundation routine! This post was in collaboration with Luminess Air, my go-to for airbrush makeup essentials!